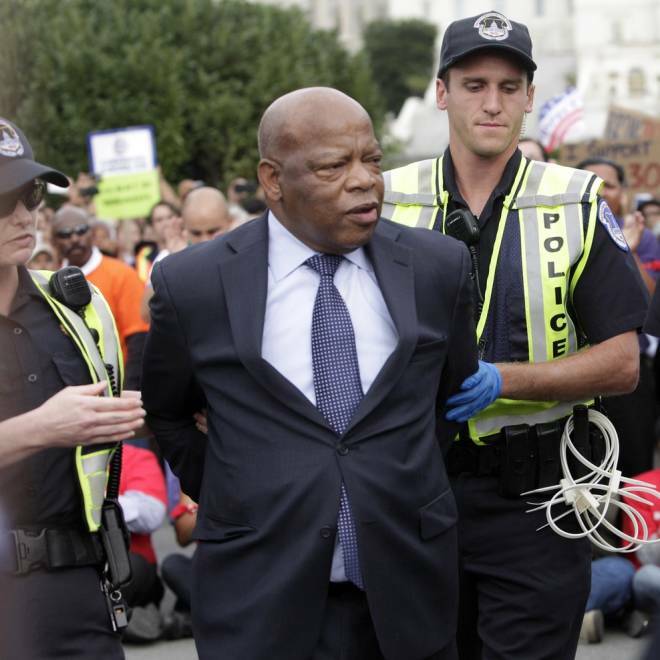 Representaive John Lewis (D-GA) is arrested on Capitol Hill in an act of civil disobedience to encourage support of immigration reform, October 8, 2013 on The National Mall in Washington DC as thousands rallied in support of immigration reform on the National Mall in Washington DC. Eight Democratic lawmakers were arrested Tuesday while advocating for comprehensive immigration reform in front of the U.S. Capitol. Democratic Reps. John Lewis of Georgia, Luis Gutierrez of Illinois, Charlie Rangel of New York, Raul Grijalva of Arizona, Joe Crowley of New York, Jan Schakowsky of Illinois, Keith Ellison of Minnesota and Al Green of Texas were all detained by Capitol Police. The politicians, along with activists who attended an immigration rally on the National Mall Tuesday afternoon, staged a sit-in near the west side of the Capitiol. Authorities arrested the lawmakers for crowding and disrupting the streets around the Capitol. Police arrested almost 200 people during the protest. "We cannot rest, we cannot be satisfied until we have comprehensive immigration reform," Lewis told reporters earlier in the day. The arrest was Lewis' 45th, according to his twitter account. The civil rights advocate has been known to participate in sit-ins and protests throughout his many years in Congress. "My colleagues and I are not afraid to get arrested for what we believe is important to move America forward," Rangel tweeted. Thousands descended on the National Mall on Tuesday for an immigration reform rally and march. Mostly Democratic politicians took the stage, encouraging those gathered to not give up on the fight to reform the country's immigration laws, despite the bleak political climate that has shut down the federal government and sidelined any hopes of reform. But despite the day's enthusiasm for reform, any sort of comprehensive bill will be an heavy lift in the current political climate. In June, House Speaker John Boehner declined to put a Senate-passed immigration bill up for a vote, waiting instead on “piecemeal” legislation from GOP House members. That effort never materialized. Still, the rally was largely aimed at telling those pushing for reform to not give up hope. "I thank you for subscribing to the idea: Don't agonize, organize," Minority Leader Nancy Pelosi told the crowd. "Let us act without further delay, let's get a vote on the Floor...because the time for immigration reform is now." "Si se puede," she yelled -- "Yes we can." NBC News' Luke Russert and Frank Thorp contributed reporting.